Years ago I had the privilege of having Jules Maidoff as a professor at Studio Art Centers International in Florence, Italy. To this day he was the best professor I've ever had. He tried to break me of my old habits by forcing me to draw with a cut-up bamboo stick. It took awhile, but he finally got me to paint with more expression. 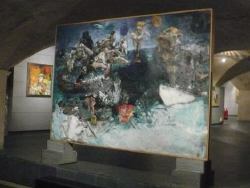 Jules currently has an exhibition in Florence at the Museo Marino Marini until October 25. (To translate the museum's website into English, enter the URL here) The show includes his work from the past 15 years and contains around 60 paintings. The museum has the largest collection of Marino Marini's work in the world. Jules was born in New York City on May 6, 1933 and attended a high school for the arts. Some of the higher schools of learning he attended are Cooper Union, the Art Students League and New York University. He has had shows at the Uffizi Gallery Museum, Galleria Schneider, the Orvieto, Museum of Modern Art in New York, Corcoran Gallery of Art in Washington, DC, the National Academy of Art in New York, the Riva del Garda, andmany others. His work has also been published on televisio. His work has appeared on the ABC National Network, NBC and WABD. He created the designs for the first network poster images for the public broadcasting FM station in New York. In 1970 he purchased a home in Plan deSco' in Arezzo, Italy and later moved to Italy in 1973. 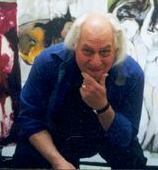 In 1975 he was one of the founders of Studio Art Centers International and was its first resident director. In his current exhibition, there is a painting he did this past May entitled, "Paul Guiguin in Tahiti." Says Maidoff about the painting, "Paul Gauguin was a master of color and the speculation and research he applied in his painting is often overshadowed by the gossip about his personal life. One should remember that he fought the French exploitation of the Islands vigorously and paid for his moral stand! No one's life is as simple as the biographers tend to instill." At the age of 75, Jules shows no signs of slowing down. He has just acquired a new studio in Florence. Jules has his own website and you can see many of his paintings and biography there. NOTE: Since the publishing of this article in 2008, SACI now has their own Facebook page. E-mails and Facebook images are this artist's subject matter. Now Miami artist Alejandro Vigilante is promoting an exhibition featuring everyone's Facebook profile picture. He uses Robert Rauschenberg's technique with acrylic on wood. Alejandro says he wants to be the new Andy Warhol of the 21st century. Alejandro's also has a Facebook page you can visit. You have to request him as a friend to see the page.